colourful La Boca district, the famous May Square, modern Puerto Madero and beautiful Recoleta. Day at leisure. Optional visit of the Tigre Delta or visit of a Tango Show inclusive dinner at El Viejo Almacen Show house (seat-in without guide). Flight to Iguazú and transfer to the hotel on the Argentine side. Explore the Brazilian side of the falls with views of the full scale of the more than 250 cascades. Full day excursion to visit the Argentinean side of the famous Iguazú waterfalls, including the Devil’s Throat, the most prominent and one of the highest falls. Day at leisure. Optional excursion to visit the Guarani village Fortín Mborore or a local Yerba mate farm. 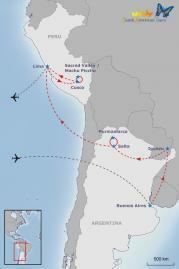 Flight to Salta and transfer to your hotel. Half day city tour with drive up to San Bernardo Hill and visit of the Art & Crafts market. Transfer to Purmamarca with its ancient church and the fascinating „Hill of 7 Colours“. Continue to the spectacular salt flat Salinas Grandes. Overnight in Purmamarca. Day at leisure. Optional excursion to the community Hornaditas with a short hike accompanied by llamas. Visit the Quebrada de Humahuaca, one of the most fascinating gorges in South America with colourful rock formations, craggy rocks and a beautiful panorama. Flight to Lima and transfer to the hotel. City tour with visit of the Monastery of San Francisco and the Lima Art Museum (MALI). Flight to Cusco. Visit of the Sacsayhuaman ruins where a shaman ceremony will be held. Transfer to the Sacred Valley with stop at the Awanakancha community to meet the traditional weavers and see llamas and alpacas. Overnight at Hotel Sonesta Posada Yucay. Visit of the Chichubamba community. Choose 3 activities like creating ceramics, producing artisanal chocolate or textile art to get in touch with the local people. Lunch with locals is included. Hike in the Sacred Valley to the salt flats of Maras and the ancient circular terraces of Moray. Take the Vistadome train to Machu Picchu, the only known Inca city to remain intact. Guided tour of the citadel’s agricultural terraces, houses and temples. Return to Cusco by train and bus. Overnight in Cusco. Walking city tour with visit of the Plaza de Armas, the cathedral and Korikancha, the temple of the sun. Another highlight will be the San Pedro market with a wide variety of Andean products.